One of the most popular types of window treatments in the home are blinds. They’re a simple, functional, and (arguably) stylish touch that provide a sense of security for homeowners. Blinds are simple to open on a beautiful day, quick to close for a little privacy, and easy to clean. Due to the high demand, manufacturers are making them in a variety of shapes, sizes, and materials to meet expanding consumer tastes. This growing list of available options introduces added opportunities for natural cleaning methods. Here are a few ways we recommend solving the question of ‘how to clean blinds’ without toxins and harsh chemicals. Regardless of material, there are universal ways to clean blinds that are environmentally friendly and effective. Any type of feathers, microfiber, cotton cloth, or soft hair duster will work well. Move from side-to-side in the same direction as the slats. Start at the top as dust and/or dirt may fall onto lower slats during cleaning. Another option it using a paint brush. They have soft bristles, come in a variety of sizes, and allow for detailed work if needed. When dusting vertical blinds, move downward along the slat. The brush attachment is a good way to lift dust and then remove it without damage. Follow the slats from side-to-side for the best results. An up and down motion could be harmful and is less effective. TIP: Completely close the slats to reach more surface area. When vacuuming vertical blinds, move downward along the slat. 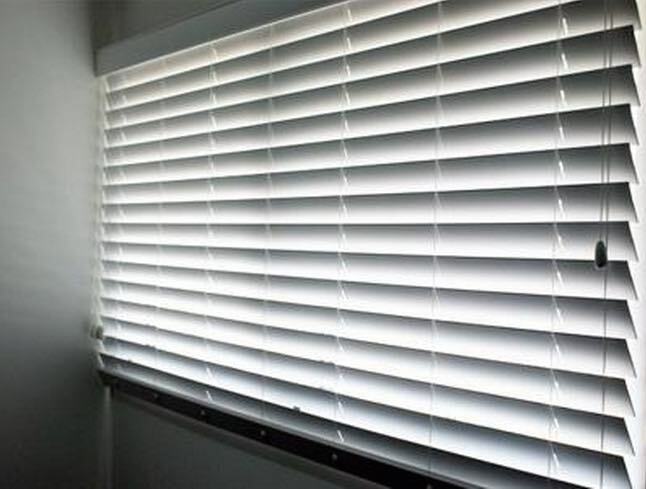 Using an upward motion can cause the blinds to become unhooked. NOTE: We always recommend using vacuum cleaners with HEPA filters. Known, also, as a dry sponge will safely remove stains, dirt, and dust from both fabric and vinyl blinds. Start by pushing down with less force and increase as warranted. As with other methods, wipe along the slat and start at the top of the blinds. Fingerprints, moisture stains, and dirt build-up may need extra work. Use a damp rag and tackle small sections. Gently wipe the area dry with a microfiber cloth to avoid spotting, streaking, or staining of any kind. TIP: Don’t forget to clean both sides of the blinds. We would hate for anyone to take the time and make the effort of cleaning and later discover they’re only halfway done. In the case that your blinds require special care, consult with the manufacturer for their recommendations. Below are tips on cleaning blinds by type. Just like your bed’s comforter or curtains, fabric blinds can become dirty over time and may need a little more “Umph!” than a Do-It-Yourselfer can provide. We recommend taking them to a local dry cleaner for a professional cleaning. Soft dusters, microfiber cloths, vacuum cleaners, and rubber sponges are all options for cleaning wooden blinds. In limited quantities, water can also be effective. Be sure to dry the slats immediately. Allowing them to soak is not recommended. You can exercise a little more freedom with the cleaning of metal blinds. One method is to put them in an open area on a towel or rug. Use a mixture of (mostly) water and dishwashing liquid and wipe the length of the slat with a soft rag, brush, or microfiber cloth. Rinse the slat and turn it to let the water drain. Repeat until done. If it appears that the water isn’t draining well enough, wipe the slat(s) with a dry microfiber cloth. Do you happen to have an old pair of white cotton gloves laying around? We have friends who use them for cleaning. Mix white vinegar (love vinegar!) and warm water in equal parts. Dip your fingers into the solution (gloves on) and rub across both sides of the blinds. Wash windows with a vinegar & water solution and a squeegee (if available); otherwise, use a microfiber cloth. Clean the window sill with a damp cloth. If rain or condensation collect, don’t let them sit long. Remove dirt from window screens by gently wiping each side using a microfiber cloth. Combine baking soda and water to remove mold or dirt from the window tracks. To help reduce your exposure to allergens, try to avoid decorating with long or heavy curtains, thick drapes that are difficult to wash, or tapestries. Consider installing blinds, shutters, or (light) washable curtains to keep the maintenance easier and home environment healthier. If you don’t have the time to maintain the home because of a ‘too busy’ life, call your local Maid Brigade to discuss how we can customize a cleaning for your individual needs. Complete our quick, easy, and No Obligation Estimate Form or call us today at (866) 800-7470 for more information.